Our biggest saw is great on bone and with its dual handles a team can easily split wild game in two in mere seconds. The steeper tooth angle is fierce on wood as well. 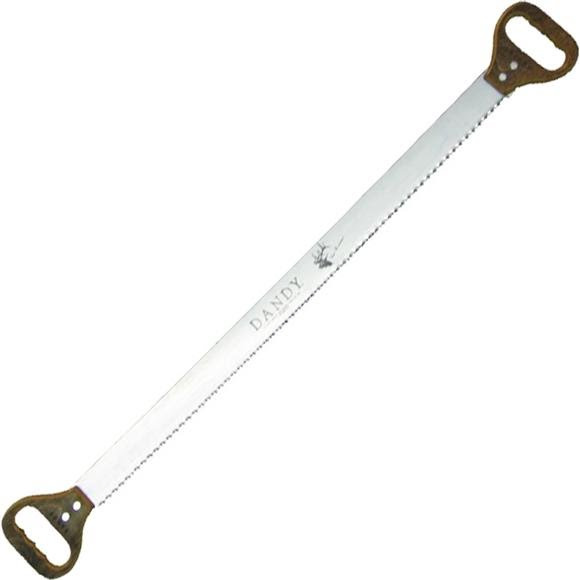 Clearing trail and putting up firewood in wilderness areas is a breeze with this saw. The Dandy® can still be operated by one person if needed. Our biggest saw is great on bone and with its dual handles a team can easily split wild game in two in mere seconds. The steeper tooth angle is fierce on wood as well. Clearing trail and putting up firewood in wilderness areas is a breeze with this saw. The Dandy® can still be operated by one person if needed. The Swedish band saw steel holds an edge remarkably well giving you a reliable tool for a host of projects. Each saw we sell has is painstakingly hand crafted to meet the rigorous demands of outdoor adventure. Blades are cut ground and finished with extreme care and do not receive a stamp until the meet our highest standards of quality.